High-flying city side Netherton United had more cause for celebration at the Peterborough League AGM at the weekend. 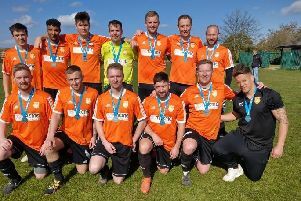 The Premier Division champions, who also won three other trophies last season, picked up another coveted prize when club stalwart Ron Seddon was awarded the league’s outstanding contribution to football prize. Seddon is a founder member of the club, which was established in 1991 and moved from Thorpe Junior School to The Grange two years later. Seddon oversaw that move as chairman and was the driving force behind the development of the ground which now boasts superb facilities including a 3G pitch. The club entered the Peterborough League in 1998. The Owen England Shield for Administration: Stuart Manning of Moulton Harrox FC. The Peter Goodhand Sportsmanship Shield for Team of the Season: Stamford Lions ‘A’. The Ralph Leigh Memorial Cup for Referee of the Year: Craig Hardy. Young Referee of the Year Award: Ben Lilley. Groundsman Award Season 2017/18: Runner-Up - Dave Johnson of Peterborough ICA Sports FC; Winner - Michael Patchett of Sawtry FC. Club Secretaries with 5-year Service Award: Ian Hair of Netherton United FC; Carl Wilson of Tydd St Mary FC; Leon Fedasch of Stamford Lions; Rebecca Morley of Stamford Belvedere. 50 Years’ Service to Football: Alan Mutton; Peter Chappell; David Barfoot; Richard Lattimore; Reg Parker. The Jack Hogg Respect Award as marked by Referees: Stamford Lions ‘A’. The Premier Division Assistant Referee of the Year Award: Noel Furlong of Leverington Sports FC. The Dave Bennett Outstanding Contribution to Football: Ron Seddon of Netherton United FC. ChromaSport & Trophies League Shield: Eunice Huntingdon FC. ChromaSport & Trophies President’s Premier Shield: Netherton United FC. ChromaSport & Trophies Veterans Division One Winners: Stamford Belvedere Veterans. ChromaSport & Trophies Veterans Division Three Winners: Stamford Lions Veterans. ChromaSport & Trophies Division Five B Winners: FC Parson Drove Reserves. ChromaSport & Trophies Division Five A Winners: Glinton & Northborough Reserves. ChromaSport & Trophies Division Four Winners: Eunice Huntingdon FC. ChromaSport & Trophies Division Three Winners: Cardea FC. ChromaSport & Trophies Division Two Winners: FC Parson Drove. ChromaSport & Trophies Premier Division Winners: Netherton United FC.